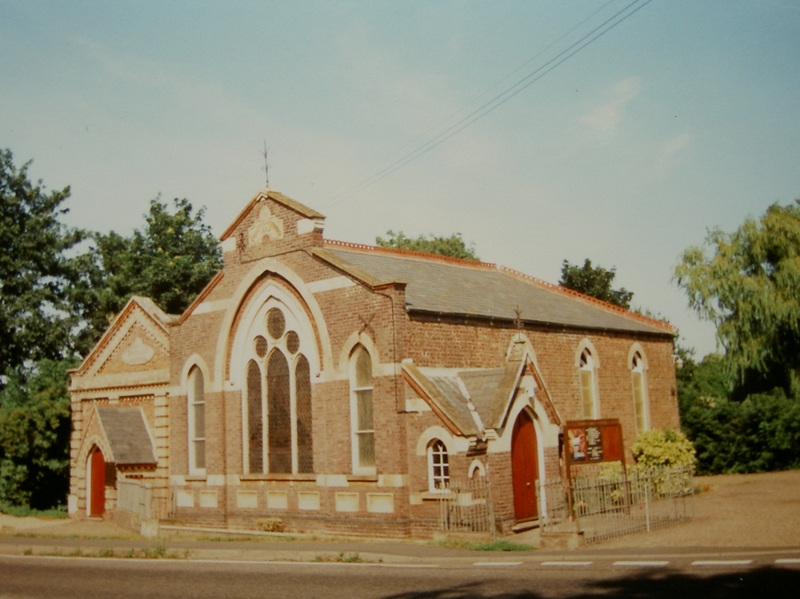 The first Tydd Gote Primitive Methodist chapel dates from 1843 in West Street. It was soon too small and in 1859 a new chapel was built behind the present British School building on the current site; its location is now partly in the garden of the adjacent bungalow. In Keith Guyler’s picture, the chapel is on the right and the building on the left is the British School. The Primitive Methodist magazine has an account of the opening of the chapel which was in the Wisbeach circuit, although it calls the chapel Tyd Gate. Opening services took place on July 17th 1859. Speakers at the services and following day’s tea meeting included R Howchin, (Lynn), Rev Mr Archer (Wesleyan), J Crabtree, Rev Dalby (Wesleyan), Rev Hester and William Crown who wrote the article in the Primitive Methodist magazine. The School building dates from 1869, ten years after the chapel. It was built by the Trustees in order to allow all children in the village to have access to basic education. It continued in this use until state education for all became established, after which its use was as Sunday school. As the congregation continued to grow a third chapel was built on the same site in 1903. The building incorporated 5 cisterns to capture water as the village did not have mains water until 1929. The chapel closed in 1976. Ref. 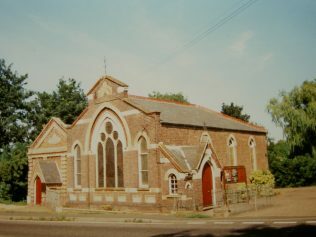 MLI97235: This is listed as a Methodist Chapel, Main Road, Tydd St. Mary, but it was a Primitive Methodist Chapel built in 1903. There is a ornate ashlar tablet with ‘Primitive Chapel 1903’ on a gable. The building in 2010 became The Newfrontier Church. Lincolnshire County Council list the buildings as of historical and architectural interest. The (chapels are) in the hamlet of Tydd Gote in the parish of Tydd St Mary. I believe the British School was erected by chapel members, some of whom also gave of their time in teaching. The British Schools were the nonconformist’s answer to the National Schools supported by the Established Church. The Boston Guardian of March 1894 tells how several choirboys from Tydd St Mary church attended the Primitive chapel in Tydd Gote. For this “heinous sin of schism” they were censured and ordered to wear black surplices instead of white ones on the following Sunday. “For of such is the Kingdom of Heaven”, quoteth the paper. On Google Street View in 2016 it is named Fenlands Church. There is an excellent account of how the Primitive Methodist society developed in a booklet on the Fenland Church website. Thanks for the clarification David. I’ve moved all the pages into Lincolnshire. Our practice is to classify chapels into the historic county rather than the current one. This inevitably leads to some confusion (especially in parts of the country I am less familiar with!). Place names often change over time and it is not surprising that names associated with early Primitive Methodists vary quite a bit. The Prims had limited education which led to creative spelling, made errors in transcribing handwriting and had printing processes with no spell-checker. It all adds to the puzzle to unscramble. Wrong county? Tydd Gote (a hamlet) is part in Tydd St Mary (Lincs) and a lesser part in Tydd St Giles (Cambs) – the North Level Main Drain divides the two. The extant ex PM chapel is in Tydd Gote (Tydd St Mary parish) as were its predecessors. These are already entered on the Lincolnshire section of this site. Just to add to any confusion the names have also been spelt Tid, Tidd and Tyd; and Gowt and Goat. I think “Tyd Gate” must have been a slip of the pen.